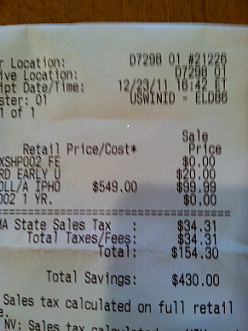 I Paid a 22.2% Sales Tax! This holiday weekend, the Webman played Santa Claus for the family, just like many of you. One of the stops was to the Verizon store for an early smartphone upgrade for one of my daughters. (And yes, she is using my upgrade yet again) Anyway, the upgrade price for a iPhone 4, white, is $99 so I am feeling pretty good about this purchase. And then it broke down. First news from the Verizon representative, was that their was a $20 charge for an early upgrade. Hmm, so they have their hand in my pocket here as it does not cost them anything to do this, but they need to subsidize some cost or just boost the revenue line a bit. I like this as much as I like change fees on airlines – NOT ONE BIT. But hey, I am still doing pretty well by getting a new iPhone for $119 right. So feeling a bit screwed but can tolerate. What the heck is going on here? $34.31 for tax on a $119 purchase? You have got to be kidding me. So the Verizon representation calming talks about Taxachusetts (He has had to explain this before I presume) and about how they need to pay tax to the state not on the sales price but on the “Value” of the smartphone, which as you can see on the receipt is $549. So I am paying the 6.25% tax rate on $549 and not on the $99. So I choose not to shoot the messenger and do a little research myself. And there you have it. A 22.2% tax on cellular phones in Massachusetts. Be afraid, be very afraid of where this might lead. You cannot make this stuff up.